Raumfahrt+Astronomie-Blog von CENAP - Blog: Astronomie - Die entfernteste Galaxie entdeckt: Galaxy von Epoche 700.000.000 Jahre nach dem Big Bang gesehen. RIVERSIDE, Calif. — University of California, Riverside astronomers Bahram Mobasher and Naveen Reddy are members of a team that has discovered the most distant galaxy ever found. The galaxy is seen as it was just 700 million years after the Big Bang, when the universe was only about 5 percent of its current age of 13.8 billion years. Results appears in the Oct. 24 issue of the journal Nature. In collaboration with astronomers at the University of Texas at Austin, Texas A & M University, and the National Optical Astronomy Observatories, Mobasher and Reddy identified a very distant galaxy candidate using deep optical and infrared images taken by the Hubble Space Telescope. Follow-up observations of this galaxy by the Keck Telescope in Hawai’i confirmed its distance. 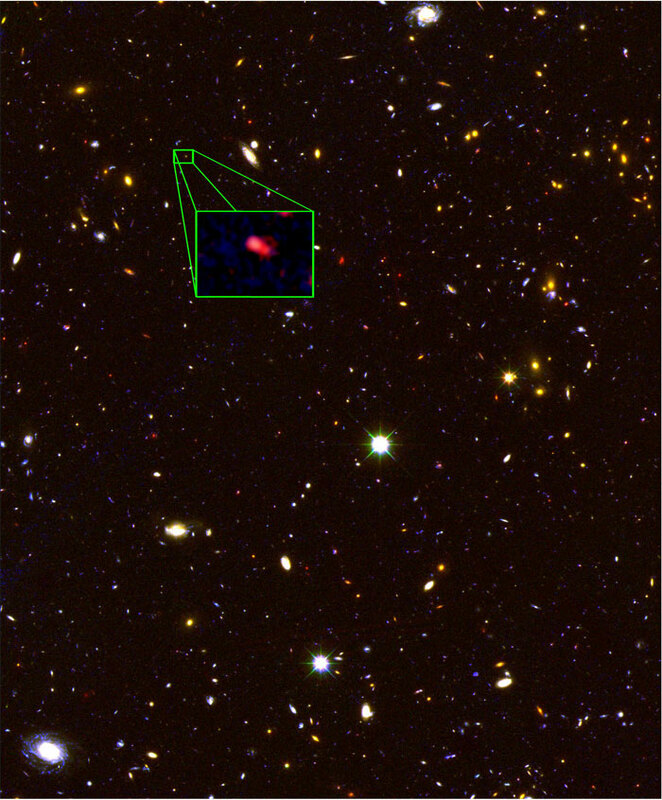 In searching for distant galaxies, the team selected several candidates, based on their colors, from the approximately 100,000 galaxies identified in the Hubble Space Telescope images taken as a part of the CANDELS survey, the largest project ever performed by the Hubble Space Telescope, with a total allocated time of roughly 900 hours. However, using colors to sort galaxies is tricky because some nearby objects can masquerade as distant galaxies. Therefore, to measure the distance to these galaxies in a definitive way, astronomers use spectroscopy — specifically, how much the wavelength of a galaxy’s light has shifted towards the red-end of the spectrum as it travels from the galaxy to Earth, due to the expansion of the universe. This phenomenon is called “redshift.” Since the expansion velocity (redshift) and distances of galaxies are proportional, the redshift gives astronomers a measure of the distance to galaxies. “What makes this galaxy unique, compared to other such discoveries, is the spectroscopic confirmation of its distance,” said Mobasher, a professor of physics and observational astronomy. Mobasher explained that because light travels at about 186,000 miles per second, when we look at distant objects, we see them as they appeared in the past. The more distant we push these observations, the farther into the past we can see. The discovery was made possible by a new instrument, MOSFIRE, commissioned on the Keck Telescope. Not only is the instrument extremely sensitive, but it is designed to detect infrared light — a region of the spectrum to where the wavelength of light emitted from distant galaxies is shifted — and could target multiple objects at a time. It was the latter feature that allowed the researchers to observe 43 galaxy candidates in only two nights at Keck, and obtain higher quality observations than previous studies. By performing spectroscopy on these objects, researchers are able to accurately gauge the distances of galaxies by measuring a feature from the ubiquitous element hydrogen called the Lyman alpha transition. It is detected in most galaxies that are seen from a time more than one billion years from the Big Bang, but as astronomers probe earlier in time, the hydrogen emission line, for some reason, becomes increasingly difficult to see. 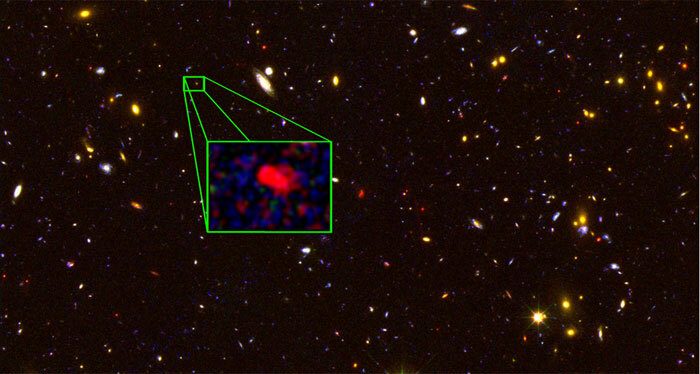 Of the 43 galaxies observed with MOSFIRE, the research team detected this Lyman alpha feature from only one galaxy, z8-GND-5296, shifted to a redshift of 7.5. The researchers suspect they may have zeroed in on the era when the universe made its transition from an opaque state in which most of the hydrogen is neutral to a translucent state in which most of the hydrogen is ionized (called the Era of Re-ionization). The team’s observations showed that z8-GND-5296 is forming stars extremely rapidly — producing each year ~300 times the mass of our sun. By comparison, the Milky Way forms only two to three stars per year. The new distance record-holder lies in the same part of the sky as the previous record-holder (redshift 7.2), which also happens to have a very high rate of star-formation. “With the construction and commissioning of larger ground-based telescopes — the Thirty Meter Telescope in Hawai’i and Giant Magellan Telescope in Chile — and the 6.5 meter James Webb Space Telescope in space, by the end of this decade we should expect to find many more such galaxies at even larger distances, allowing us to witness the process of galaxy formation as it happens,” Mobasher said. Other team members include Mark Dickinson of the National Optical Astronomy Observatory; Vithal Tilvi of Texas A&M; and Keely Finkelstein and Mimi Song of the University of Texas at Austin. Bang. The magnified image results from stacks of optical and infrared images taken, respectively, by the Advanced Camera for Survey (ACS) and Wide-Field Camera 3 (WFC3) on board the Hubble. The galaxy has a mass of ~109 times the mass of the Sun and is at a distance of ~13 billion light years from us, forming stars nearly 150 times more rapidly than our galaxy. Image credit: V. Tilvi, S.L. Finkelstein, C. Papovich, STScI/NASA.